New York - Controversial Italian Fabio Fognini was defaulted from the US Open on Saturday after making foul-mouthed comments to an umpire in his first round match. The 30-year-old Fognini lashed out at female umpire Louise Engzell with a series of misogynistic insults during his first round loss in singles to fellow Italian Stefano Travaglia. He and compatriot Simone Bolelli had reached the third round of the men's doubles but tournament organizers have now axed him from the event. 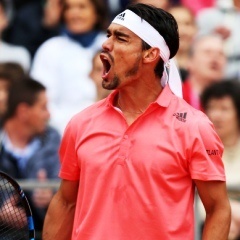 Fognini, the world number 26, had already been fined $24 000 for the incident earlier in the week. "Pursuant to the Grand Slam Code of Conduct, Fabio Fognini is hereby provisionally suspended from further participation in the US Open pending a final determination whether a major offense has been committed during his first round singles match," said a tournament statement. "The provisional suspension is with immediate effect and, therefore, Mr Fognini has been withdrawn from his upcoming doubles match. "There will be no further public comment concerning this matter until the major offense process is completed." Fognini has a controversial history over his on-court behavior and was handed a record fine of $27,500 at Wimbledon in 2014. He apologised on social media for his outburst at Engzell. "I apologize to the fans, to the referee for what happened," he wrote in Italian on Twitter. "It was just a very bad day, but it did not forgive my behavior in the match. Although I'm a hot-head (and though I've been right in most circumstances) I was wrong. But in the end it's only a tennis match."